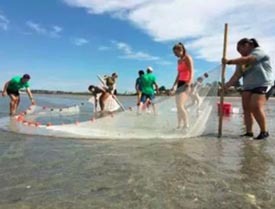 The Coastal Ocean Science Academy is a marine science day program that aims to connect young people to local coastal habitats, and the methods scientists use to study them. The program is based at the Northeastern University Marine Science Center in Nahant, but includes off-site field trips to locations both on & off the water. In 2018, the Coastal Ocean Science Academy is offered as a week-long middle school program and a two-week-long high school program. Both run from 8:30 a.m. to 3:30 p.m. each day, and they begin/end each day at the Northeastern University Marine Science Center in Nahant. This program exposes students entering seventh and eighth grades to local coastal and marine habitats, including the sandy beach, rocky shore, open water/harbor, and coastal wetlands. This is a one-week, field-trip based program where students will learn how to keep a field notebook and take basic measurements of weather, water quality, and biodiversity in different coastal habitats, all the while exploring the relationship between these parameters. Dates: July 30 through Friday, August 3. Maximum group size 20. In the introductory high school program students will develop research skills to study local coastal habitats and also explore threats to coastal and marine resources. Field studies take place during week one at a salt marsh, sandy beach, rocky shore, and on open water. During week two, students are supported in developing a group poster project using field data, and present their research at the end-of-program celebration. Dates: August 13-24. Maximum group size 20. Building on knowledge learned in Chondrus, Pagurus students will deepen their knowledge of local coastal ecology and habitats through student-led field investigation. Staff will facilitate student inquiry and research in topics of their own choosing. Ample access to field sites for data collection will be provided, as well as guidance in developing sound research questions, methodologies, analyzing data, and presenting results. Dates: August 13-24. Maximum group size 10. Programs are designed for middle and high schoolers entering grades 7-12. For more information, and to apply for the program, please download the application pack here. Please contact Val Perini at v.perini@northeastern.edu or call 781.581.7370, x373 with any questions.